Is it possible to become a total fangirl for an author based only on one book? 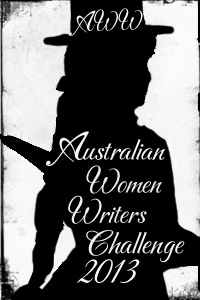 If you are me, and the author is Melina Marchetta, then apparently it is! I loved this book so much that I ended up listening to the audio version of it twice in as many weeks. It isn't out of the question that I will listen to it again or read it in book form. Given how rarely I reread, and certainly never finish a book and just start it again straight away, this is high praise indeed! I love it when a book compels you to behave in a way that you don't normally do so. 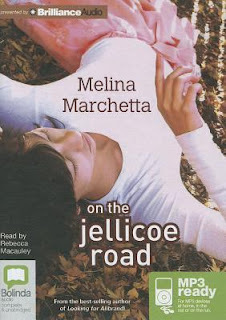 I should mention that I have been being told for years that I should read Melina Marchetta. To those people (Kat, Bree and Belle amongst others) I say, yes, you were right. So what is it about this book that makes it so good? Taylor Markham is a senior at Jellicoe School. She has just been made the leader of the boarders. This means that her most important responsibility is to lead the school in the annual territory wars between the school, the townies from nearby Jellicoe and the cadets from the city who come and camp for six weeks nearby. These territory wars have been going on for 20 years or so, and it is a very serious business. There are rules of engagement, maps, and there will be consequences if anyone steps into enemy territory. Whilst Taylor has been elected as leader, her grip on the leadership is a little tenuous, so she must do everything in her power to ensure that the schoolies don't lose any territory, and if possible to negotiate additional rights and ground with the enemy. She has only one other house leader on her side, and he must stay by her side otherwise the other house leaders have the power to usurp her position. She also has her friend Raffaela who sticks by her despite Taylor's best efforts to push her away, and perennial pest, Jessa McKenzie, that Taylor can't rid herself of no matter how hard she tries. Dealing with the enemy is going to be that much more difficult for Taylor because the leader of the cadets is a boy named Jonah Griggs. Three years earlier, Jonah and Taylor had run away together, heading towards Sydney to try and find her mother. They got to within two hours of Sydney before they were found by The Brigadier and returned to Jellicoe. Taylor has never, ever forgiven Jonah for the betrayal of ringing someone to come and get them. The leader of the townies is Chas Santangelo, whose father is the local cop, who seems to have some kind of history with Raffie, and who seems to have a predilection for leading the townies into punchups with the cadets at the slightest provocation. I was warned going into this book that the first part was a bit difficult to follow, and it was. The territory wars are taken seriously by all involved. Very seriously. I found myself wondering how on earth this story was going to progress to the amazing story that I had been lead to believe I would experience. I also couldn't figure out how it was going to link in with the other story that was also being told in glimpses through the story. In this other story, we meet Webb and his sister Narnie, Tate, Jude and Fitz, a group of kids bought together through tragedy who form a bond that is so strong that it will last a lifetime, if it doesn't destroy them all first. Taylor first learns of the group by reading the manuscript that is being written by Hannah, another person that Taylor has a difficult relationship with. Taylor first came to Jellicoe 6 years before. She was just 11 years old when her mother drove her to the 711 convenience store in Jellicoe and just left her there. Hannah came along and picked her up, brought her to the school and has since provided the only stability that Taylor has really ever known, but has always kept her at arms length. Now Hannah has disappeared without leaving any indication of where she has gone or when she will be back, and reading the manuscript is one of the few ways Taylor can still feel close to her. As Taylor reads through the manuscript she longs to know more about 'the five'. Who they were, why they were so close, why does she feel so connected to them and what, if anything, is the connection to the boy in the tree who visits her dreams every night? There was a point in the book though where everything just clicked into place - the territory wars, the story of the give, everything - and suddenly I went from enjoying the story but being a little perplexed to OMG what a book. From what I can tell, Melina Marchetta loves to torture her characters. Both groups of kids have tragic pasts and some of them even have a tragic present too. Given that, it would have been very easy for this book to tip into the overly angsty and melodramatic but the author manages to balance the drama with moments of joy, of fun and of poignancy. In short, she does an amazing job of engaging the reader and making you feel all the emotions! All of them! When I was listening to the book the first time I was getting towards the end of the book and I was crying my eyes out as I drove along, until I realised that I really needed to stop for petrol. I guess given how emotionally wrung out I was that it was no surprise when the petrol station attendant asked me if I was okay or not. I am pretty sure that I am never going to be able to hear either Flame Trees by Cold Chisel or The Coward of the County by Kenny Rogers without thinking of the characters from this book! I think my favourite thing about this book is the way that Marchetta writes the development of the friendship between the characters. Slowly Chas and Griggs go from having to spend time together as punishment to begrudgingly spending time together as a result of shared friendships to genuine friends. Similarly, Griggs and Taylor begin to build on their relationship which really began three years before on a train platform. I loved the way that Marchetta slowly allowed both Taylor and the reader to find out exactly what Griggs feels and why he has done what he has done both in the past and in the present. All the emotions.......sob! At one point, one of the characters says to the others "we are going to know him for the rest of our lives" and I felt like cheering, between sobs, and it made me think of the friends that I have that I have known since my teenage years and who I will know for the rest of my life. I also really loved the echoes from the earlier story into the later one. We are not reading the same story repeated again more than a decade later though. It is more nuanced than that, more delicately done and very, very poignant. If I had been reading the book I would have been bookmarking quotes all the way through. There were just so many beautiful moments. A fair few of them would have featured the amazing Jonah Griggs - one of the best teenage boy characters I have read in a long time. Yes, my son is only a couple of years younger than Jonah was in the book, and yes, that means that I am more than old enough to be Jonah's mother, but yes, I have a crush on him big time, and I don't care who knows it! Slightly more age appropriately, I also have a bit of a crush on Jude, one of the original five. On the Jellicoe Road is being made into a movie, and I will be very interested to see who is cast and how the movie takes shape because it is a bit difficult to see how the story will come to life if it sticks exactly to it's current structure. There are so many flashbacks and dream sequences, not to mention the internalisation of emotions and thoughts by the characters. I will be just a little scared before seeing it, hoping that it will be an amazing movie. Melina Marchetta has worked on the screenplay so hopefully it still will be something special. I was very glad to be able to go back and relisten to the book pretty much straight away. As I went through the second time I realised exactly how clever Marchetta's writing is. On the first read through, some of the plot twists seem to be pretty sudden but on the reread, you could definitely see that all the clues were all put in place, ready for the reader to make their discoveries later on in the book. I am sure if I was to physically read the book again I would find even more. I think this is a book that lends itself to being read over and over again! I should mention that the narrator of the audiobook did an amazing job! It was such a pleasure to get in the car and listen to Rebecca Macauley tell me the story of these kids. I also really appreciated the way that the the production had small musical interludes whenever the narrative changed from one time to the other. Often if you are listening to an audiobook that does feature dual timelines there is just a gap and suddenly you find yourself in the other time and place and it can be a little disconcerting as you try to figure out what just happened. None of that confusion here. I am now listening to Saving Francesca, also narrated by Rebecca Macauley and I am once again enjoying it very much. When I finished this book the first time through I gave it a rating of 4.5/5 but I think that given how much I am still thinking about the characters, the lasting impact I expect it to have on my psyche, and yes, Jonah Griggs, I think I have to change it to 5/5. I thought I would share just a couple of the songs from the book. There were lots more, but these will be the ones that will always remind me of the characters and the story of this book. I was never even that big a fan of the Waterboys song before now! I've been told I should read this book but still haven't. Your review makes me want to read it a little more. I have already been pushing this book onto people. Read it! Thanks for the reminder about this one. A friend recommended it so highly, and I am pretty sure it was years ago at this point. It still might take me awhile to get to it, but now it's on my radar again. Nicole, I hope you do get to read it because it was fabulous! After 3 years of you saying "Read this book it's awesome" and then me saying "I read that book and it was awesome" and you saying "I told you so" now I am the one who gets to say "I TOLD YOU SO!" Yay! All of the feels. Jonah Griggs. Welcome to the Melina Marchetta fanclub. It's crowded but I think you'll like it! LOL! Shove over. I am pretty sure I am bringing other people into the fan club with me! I love to see someone gushing about a book like this! I too am guilty of never having read any Melina Marchetta. Not even Looking for Alibrandi. I must get to it soon, and her other books by the look of it. It seems she moved from school based stories to fantasy though, and I'm not particularly a fantasy fan, in fact it's probably my least favourite genre. Thanks for the songs too! I am so so glad you loved this! And finally getting on the MM bandwagon ;) I might have to check out the audiobook, I'd love to reread this so that might be a good way for me to do it. I'm so excited for the movie too. Can't wait to see who is cast.